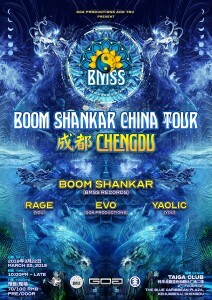 Germany based Boom Shankar is a Dj for Psychedelic Trance, the label manager of BMSS Records and an event promoter within Europe. Having been initiated into the Goa Trance scene in the early Nineties and by traveling the globe ever since, his sets are a mirror of the constant melting pot of fundamental Psytrance characteristics. Whether he is guiding the dance floor through the night or into the morning, the outcome is always a voyage filled with a depth and an energy that allows the crowd to feel a sense of freedom through Trance. Groovy, deep, mature, hypnotic and clearly distinguishable. Having played at many underground & major events worldwide, he has developed a full understanding of the flow and the energies of each dance floor and is flexible in terms of "styles". Through his impromptu sets, he is able to interact personally with each dance floor, taking the audience on a trans-formative journey. His sets are a direct form of communication through music. 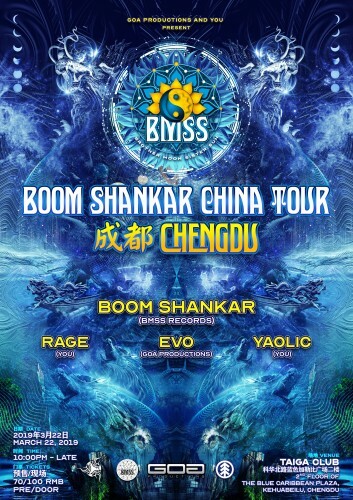 Besides this, Boom Shankar is the label manager of BMSS Records where he has released 8 best-selling compilations so far: Transmissions, Transition, Cosmic Connections, Trancendance and Trancefusion feat. artists such as Aes Dana, Braincell, Tristan, Sonic Species & Avalon, Eat Static, Pogo, Lucas & Mechanimal, Egorythmia, Ovnimoon, Touch Tone, Audioform, Headroom & Zen Mechanics, Entheoegenic, Talpa, Martian Arts, Outsiders, ManMadeMan and many more. He is working on his ninth one which will probably see the light in spring of 2018. In addition, Boom Shankar is part of the S.U.N. Festival crew in Hungary, the Alice im Wummerland party series in Germany plus is involved in many other global productions. In 2005, a friend took EVO to his first Infected Mushroom party in London, where he immediately got… well, infected! He got involved in the local scene immediately afterwards, spreading the culture and enjoying the music at its fullest! After his move to Shenzhen in 2011, he realized both the lack and the potential of Psytrance in mainland China, thus co-founding the Psytribe project to Psychedelify the masses in the Middle Kingdom. After many years and parties all around, in 2015 he met like-minded Atoned Splendor and decided to join forces in their common goal! In the same year he moved out to Yunnan to join the Spirit Tribe Project and has been a driving force ever since. Yaolic, a Psytrance Dj from chengdu,Sichuan who was deeply touched by electronic music when he was in high school.But when the psychedelic spacecraft show up in his world,he fell for psytrance and started propagating psytrance.Hoping everyone could find the purest self in the most heart stirring melodies and walk into a world of beautiful spirits by the leading of sounds.